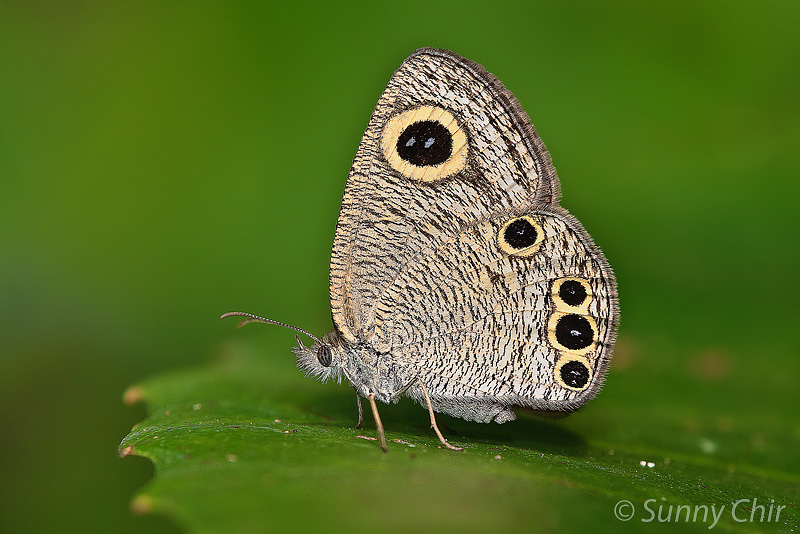 A casual reader of the Field Guide to the Butterflies of Singapore (2010) recently asked me, after looking through the pages of the Common ??? Rings. "They all look so similar and it's difficult to tell them apart. The number of rings on the wings also doesn't seem to match the English names! Why is that so?" The Rings species, as we commonly refer to them, are relatively small and unattractive butterflies and tend to fly weakly amongst low shrubbery and grasses. 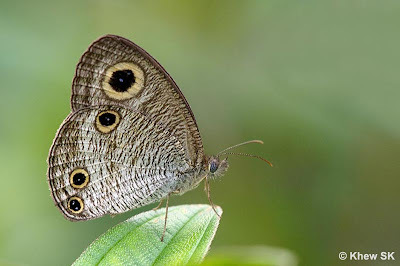 Two earlier articles in this Blog featured species from this genus, Ypthima- The Cinderella of Butterflies and Variability of the Common Four Ring. 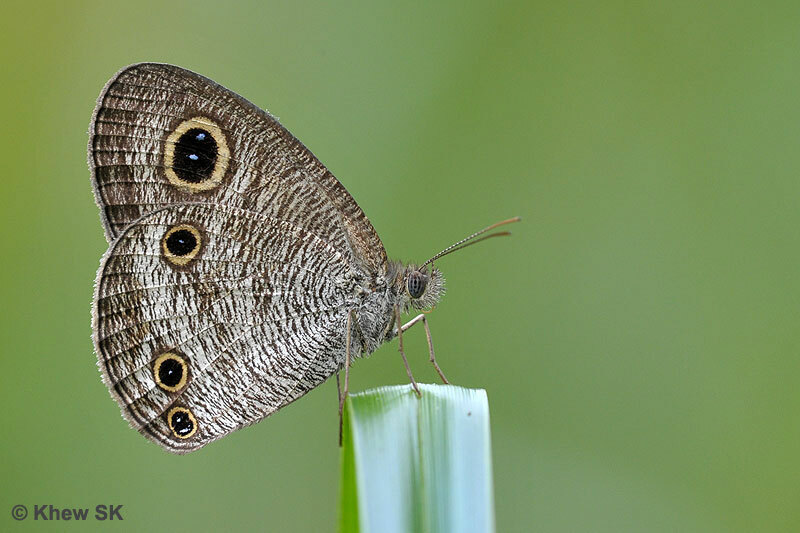 This article sums up the five extant Ypthima species in Singapore, and provides an understanding of the subtle differences amongst the five, as well as shed some light on the naming convention used for their common English names. The caterpillars of all the species of this genus comprise species of Graminae or generally, grasses. 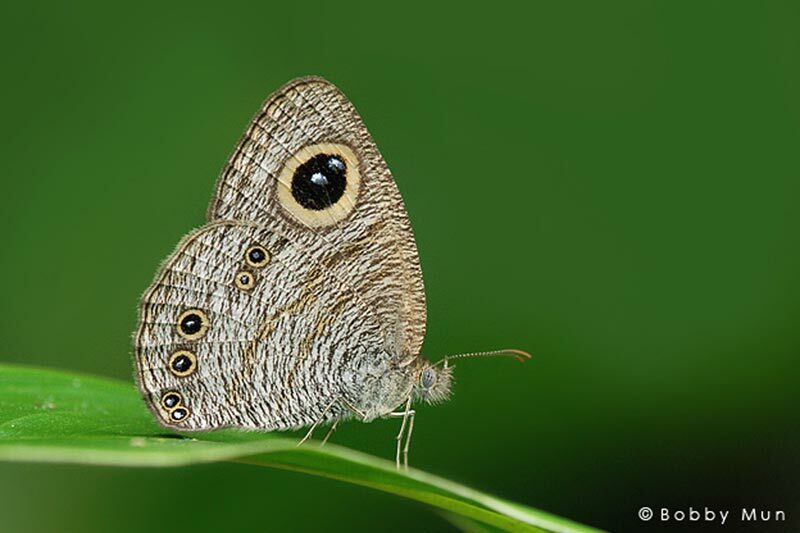 The adults are greyish or pale buff brown, with striate undersides. All have a large subapical ocellus on the underside of the forewing, with a series of yellow-ringed black submarginal ocelli on the underside of the hindwing. 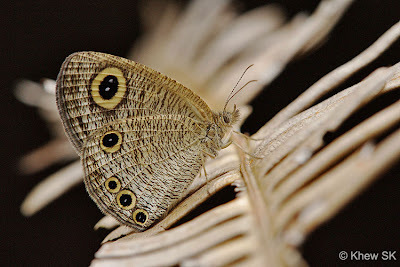 Underside hindwing with ocelli in spaces 1b, 2 and 6 only. Underside hindwing with ocelli in spaces 1b, 2, 3, 5 and 6. The ocelli in space 5 is much larger than in space 6. The ocellus in space 6 is sometimes missing, although there is not infrequently an additional small ocellus in space 4. 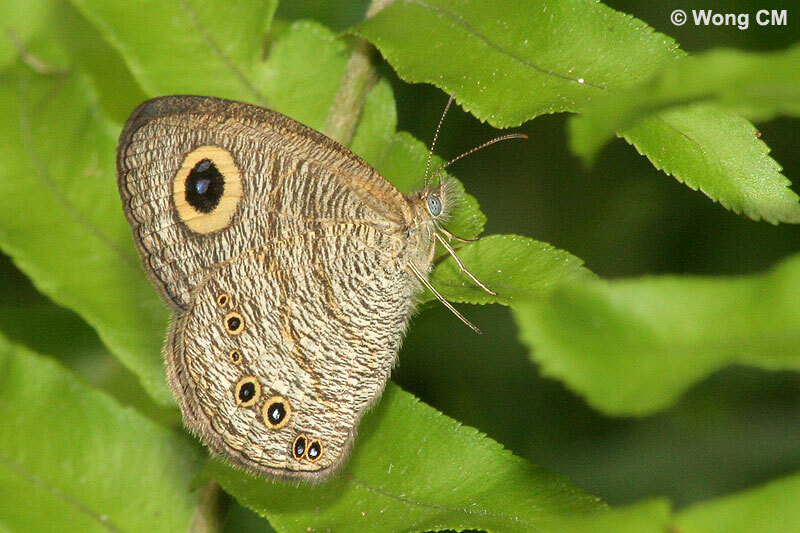 Underside hindwing with ocelli in spaces 1b, 2, 3, 5 and 6. The ocelli in space 5 and 6 are subequal, that in 5 sometimes smaller. Underside ground colour whiter. Underside hindwing with ocelli in spaces 1b, 2, 3, 4, 5 and 6. All ocelli rather small and in an almost straight line. Underside of both wings are crossed by two dark and distinct fasciae. The curious naming convention in this genus is based on the number of rings (or ocelli) found only on the hindwing of the species. In addition to that, the pair of rings, or what appears to be two rings encircled by a yellow outer ring at the tornal area of the hindwing in space 1b is counted as one ring instead of two. 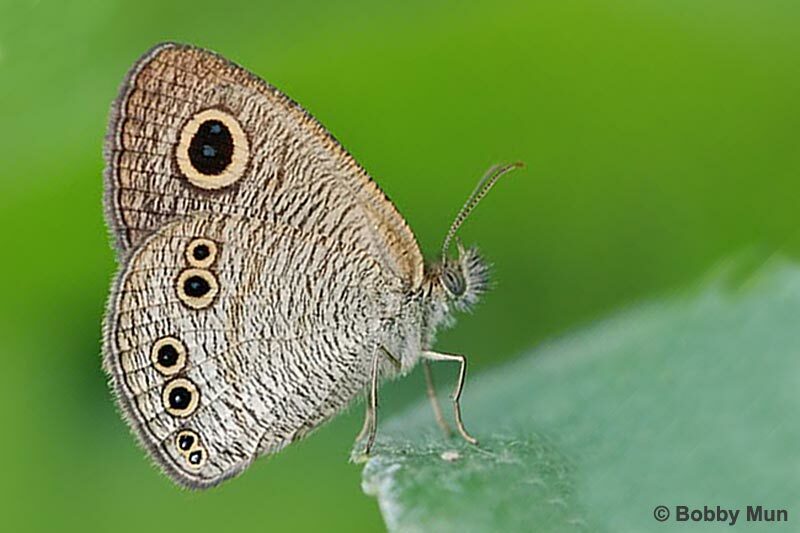 Hence in a species like Ypthima pandocus corticaria or what is commonly called the Common Three Ring, we can clearly see the number of rings on the hindwing of the species as shown in the photo below. The members of the genus are highly variable, and aberrations are frequently observed. The two species with five rings - Common Five Ring and Malayan Five Ring, are particularly controversial, where their variability may be the subject of debate as to what constitutes one species or the other! 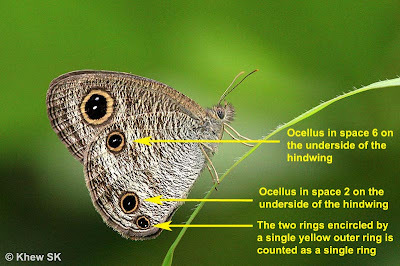 In the earlier blog article on the Common Four Ring, this phenomenon is also exhibited, where the range of contiguity and size of the ocelli in spaces 2, 3 and 6 is also the subject of debate as to whether there are two distinct species, or just merely a variability in the arrangement and size of the hindwing ocelli. 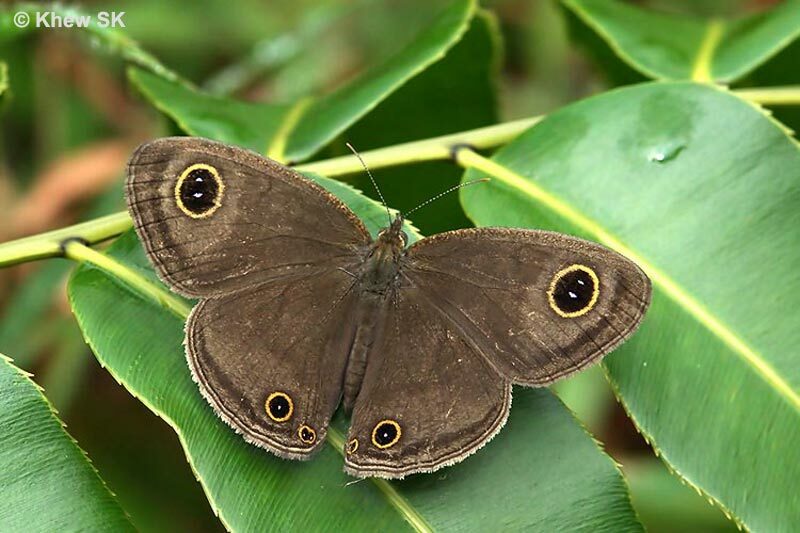 This species is the largest in the genus found in Singapore. It is locally common in locations where its preferred host plant (a type of grass) is found. It is more often found on the fringes of the nature reserves, but can occur in urban parks and gardens as well. 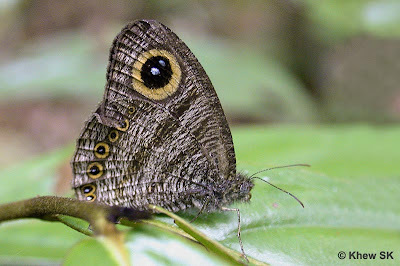 The upperside is grayish brown with a large subapical ocelli on the forewing above. 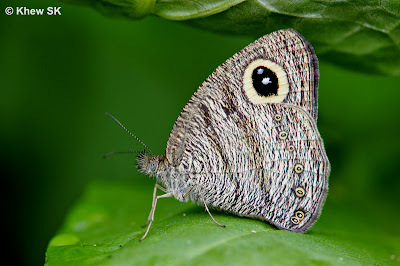 The underside is heavily striated with three large ocelli on the hindwing, which gives it its English Common name based on the naming convention described above. 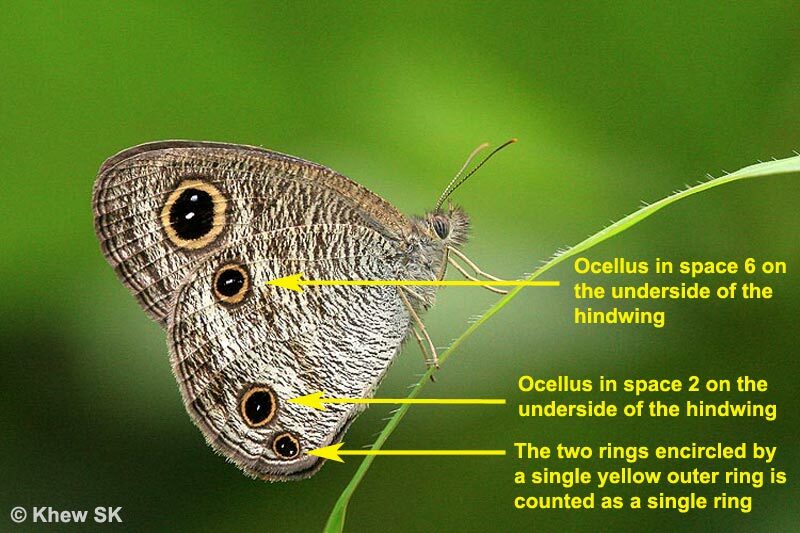 There are occasional individuals which display an additional small ocellus - sometimes contiguous, sometimes separated, from the large ocellus in space 6. 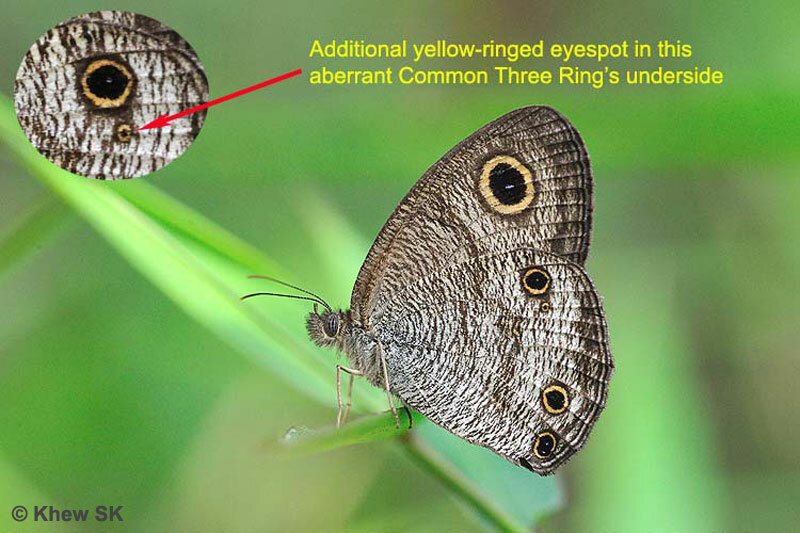 Sightings of such individuals are rare, but the photos shown above and below (a mating pair of Common Three Rings) show two examples of such variations in the Common Three Ring. 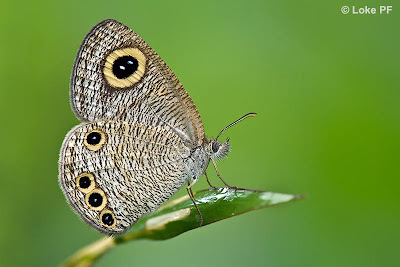 The Common Four Ring is the smallest member of the genus, with four ocelli on the underside of the hindwing. 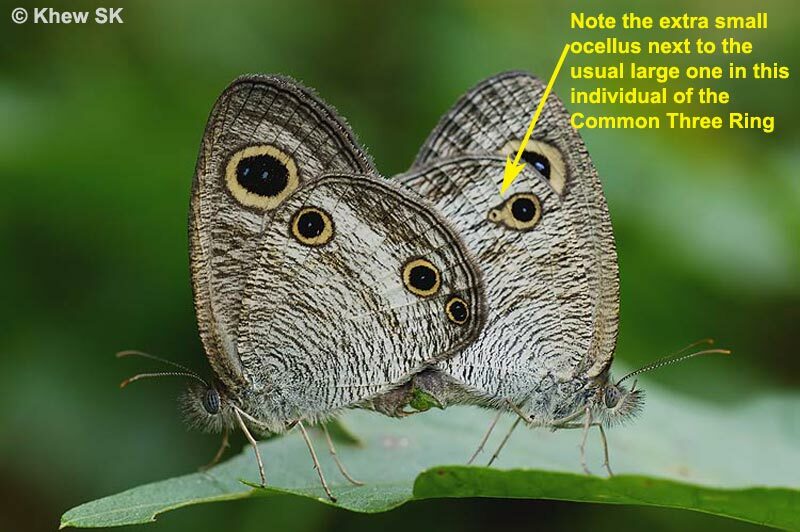 Whilst the tornal ocellus is described as in line with those in spaces 2 and 3, these three ocelli are often very variable in contiguity and size as explained in the earlier blog article. The species is relatively common, and can be found most frequently in urban parks and gardens, although their presence at the fringes of the nature reserves is also quite evident. 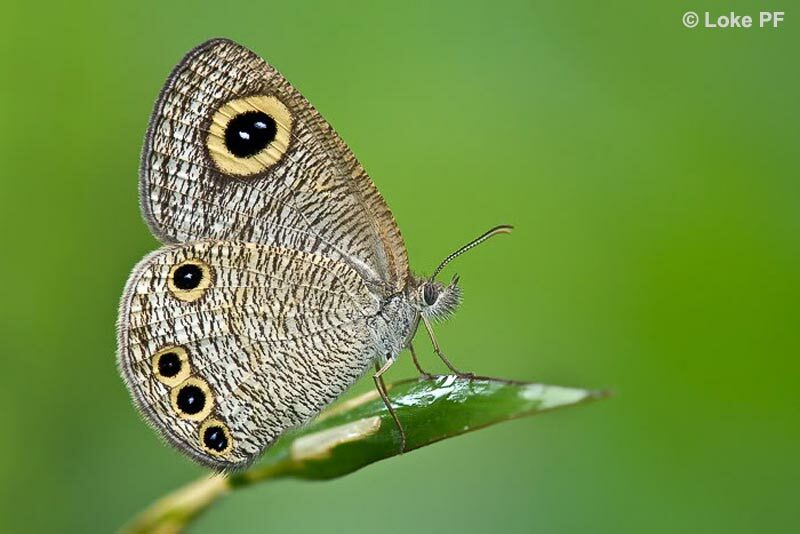 Always smaller in size than the Common Three Ring, the Common Five Ring features ocelli in spaces 1b, 2, 3, 5 and 6 of the hindwing beneath. Again, the variability of these physical characteristics bring about much debate about the species. 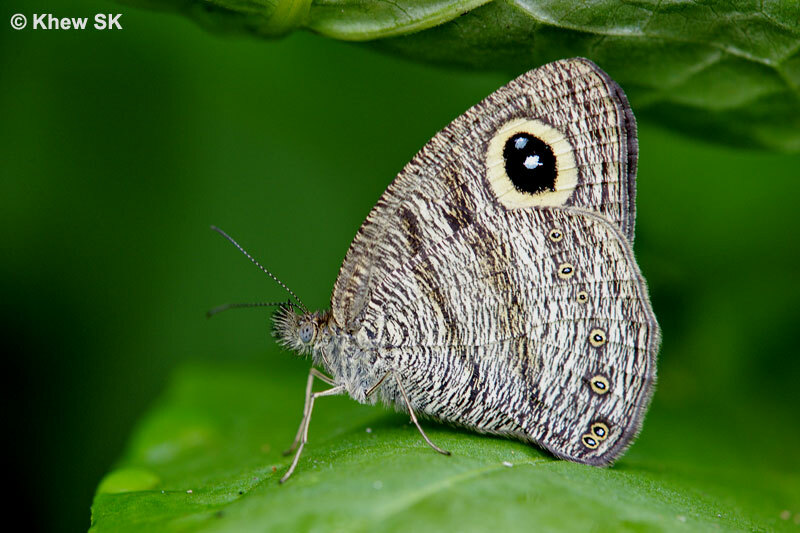 Whilst the hindwing ocelli in space 2 and 3 are "large and almost always contiguous", this characteristic appear to be not always reliable to identify this species. As if to confuse the matter even further, C&P4 records that "there is not infrequently an additional small ocellus in space 4!" This would effectively give the particular variant six rings instead of five! An example of the Common Five Ring with six ocelli is shown below. In the mating pair shot below, it shows a clear difference in this characteristic between the male and female of the species in terms of the size and contiguity of the ocelli in spaces 5 and 6. The mating pair also suggests that the two individuals are the same species, although displaying quite different ocelli characteristics. The more often ID key that is used to identify this species, is the relative sizes of the two ocelli in spaces 5 and 6, in that the ocellus in space 5 is always larger than that in space 6, irrespective of whether they are contiguous or separated. Appearing very similar to the Common Five Ring, the Malayan Five Ring's identification has frequently been the subject of debate. Sporting an arrangement of ocelli that is similar to its lookalike, this species also features ocelli in space 1b, 2, 3, 5 and 6 on the underside of the hindwing. 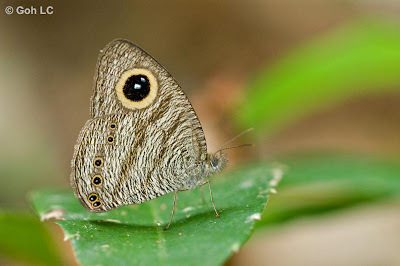 It has been described that the underside of the hindwing is whiter in appearance rather than the usual grayish buff, but in the field and with photos, the level of "whiteness" can often be misread due to lighting conditions. However, in many individuals of this species, particularly males, the slightly darker postdiscal and submarginal fasciae are more distinct. 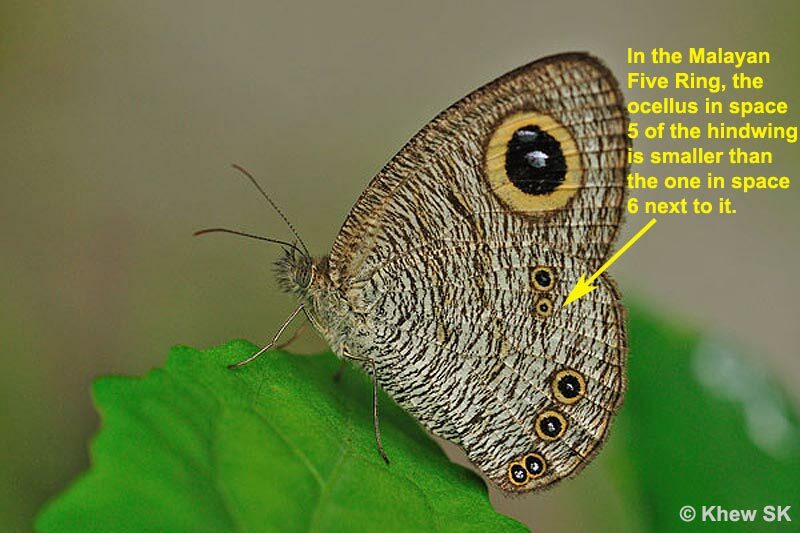 The most reliable ID characteristic thus far, would be to look at the ocelli in spaces 5 and 6. 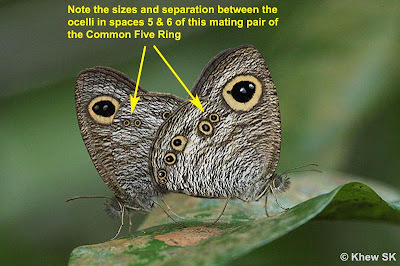 In the Malayan Five Ring, these two ocelli are usually similar in size, and more often, the ocelli in space 5 is smaller than the one in space 6. This is the rarest member of the genus in Singapore. 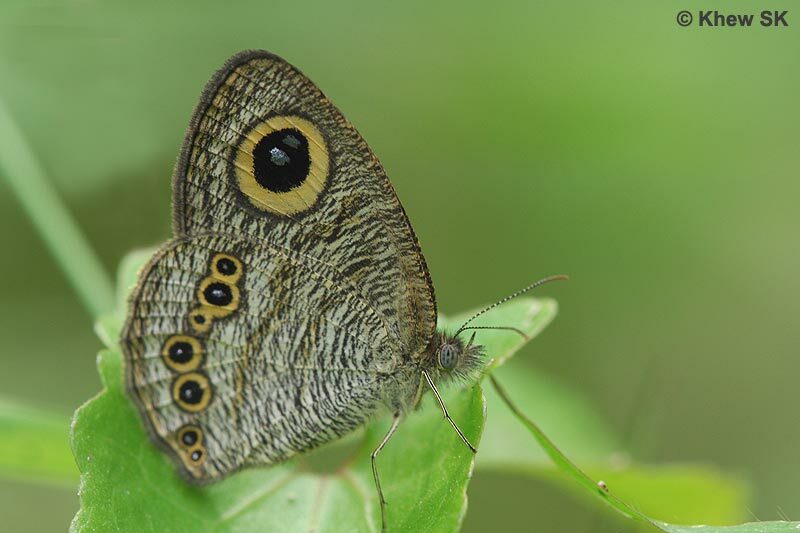 It has been rarely seen, with the last few sightings around the northernmost extent of the nature reserves in Singapore. 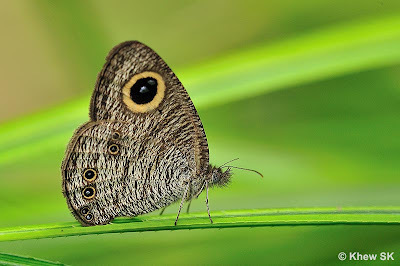 Besides having a full complement of ocelli across the underside of the hindwing, stretching from space 1b to 6, forming a total of six rings, a distinctive feature of this species is the pair of dark straight fasciae crossing both wings. 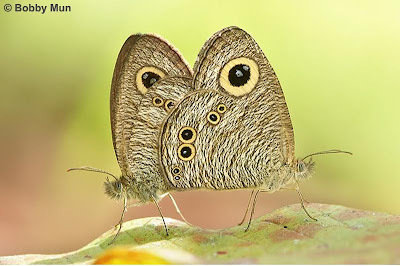 The ocelli sizes can be variable, but are usually small and separated from each other, except for the pair at the tornal area. 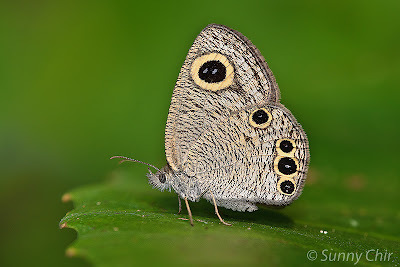 This article compares the five species of the Ypthima in Singapore, and we hope that it has been helpful in aiding observers of the species of this genus to separate and identify them. 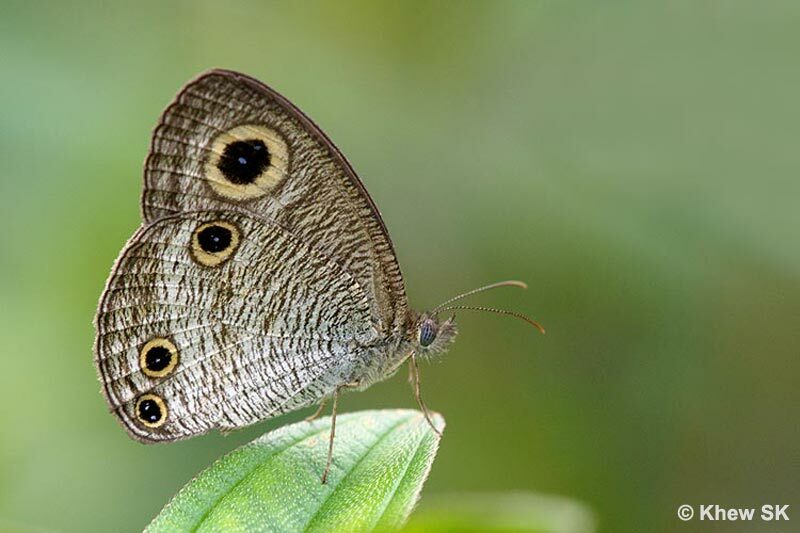 References : [C&P4] The Butterflies of The Malay Peninsula, A.S. Corbet and H.M. Pendlebury, 4th Edition, The Malayan Nature Society.